Monday is another start to the working week and also the worse day of the week for me. Not only does Mondayitis set in but I have 8 meetings lined up back-to-back that eats up the whole business day so I often find myself finishing off report consolidation at home after dinner. It's definitely not the ideal start for anyone! Given Mondays are a brain-drain day for me, I usually can't think straight to write a beauty post. Instead, I thought I’d introduce snippets of interesting things that aren't so beauty focused to just add a bit of variety to the blog (and let's face it, you're probably sick of reading the 100th beauty review on a lipstick or face cream and I'm). I'd like to start with a show-and-tell post and share with you what I carry with me on a daily basis. 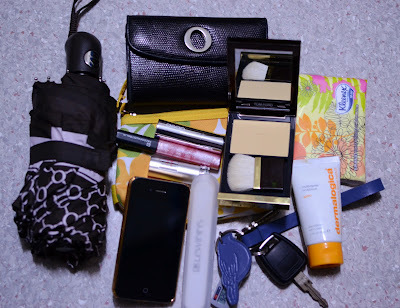 Yep, today you get to peek inside my handbag and see what I cannot leave the house with. 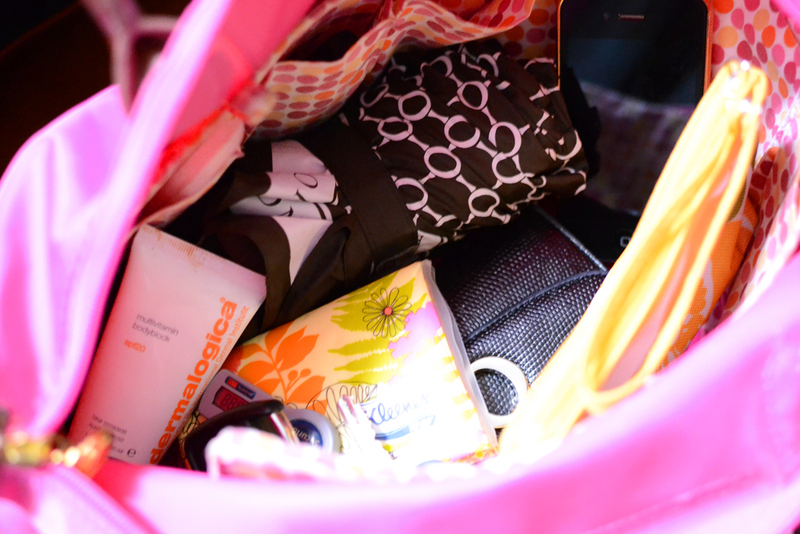 My bag of choice is a tote because it can open up and fit so many items when needed and still looks stylish. For the past few weeks I’m carrying my small Longchamp Le Pilage tote in hot pink (hey I have to contrast it with all the dull black and dreary grey colour I wear for work during the winter month). This was a gift from my aunt earlier in the year. It's lightweight, cute and easy to hold on the arms or over the shoulders. Truly, I think everyone needs a Longchamp tote in the life. So let’s take a look inside to check its contents shall we? I use a Purseket, the pink polka dot bag liner/organiser you see in the photo below, to add compartments to an otherwise big bag to give it structure and to organise my contents. I don’t think I can live without one of these things in my handbag anymore. 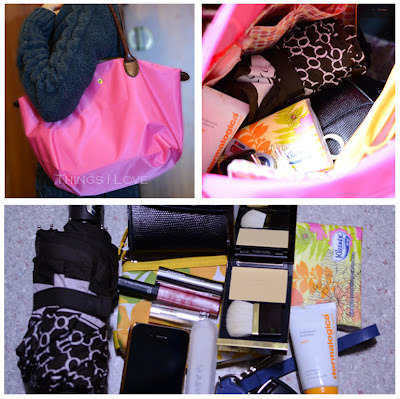 It also makes it easy to transfer contents from one bag to another if you like to change your bags frequently as you just lift the Purseket organiser and pop it into your new bag. Now lets check what's floating within and amongst all these compartments. Oroton Umbrella – with all the rain in Melbourne lately, having this small fold up brolly is a-must if you don’t want to be caught out like a drenched cat. Oroton Wallet – it holds my cash, cards and IDs. Say no more. Kleenex To Go tissues* – these slim and easy to carry in bags or your back pocket comes in packets of 6 tissue in assorted pretty and funky prints that would match your bag or add style to it (this floral one matches my pink bag just fine). Tissues are always handy to have and I use it to blot my face (because I’m too lazy to carry facial blotters), clean my greasy hands after eating and help with the sniffily nose in the morning. Dermalogica Multi-vitamin Body block SPF20*. It may be grey and raining but there is still UV rays on overcast day. I carry this SPF moisturiser all the time for when the sun peeks out and I need to protect my arms or a top up on my face and neck when I’m rushing between buildings for meetings. Nail file – I have a bad habit (we’ll talk about that in another post) that always sees me breaking nails. This filer from Dr. Lewins that I got as a Priceline freebie ensures my nails are tidied up on the go to prevent further damage and leaves no mess with its own storage compartment. ASAP Pure lipstick in Four* – smooth creamy and luscious. Every girl needs a lipstick at her disposal at all time. This one is shade and is my daytime office shade (swatches coming up). Face of Australia lip Shine in Morning Mist*. Pretty and pink and ultra glossy with shimmer. I love slicking this on when my lips feel abit dry. Lancôme Rouge in Love in 159B. When I’m heading out or need a pick me up colour – this baby comes to the rescue. Tom Ford Illuminating Powder*. My go-to press powder with its own brush for touch up during the day to keep the shine in check and give my skin a light fresh glow. I love how light and sheer it is and makes skin feel like silk. Other items not shown in the photos are my train tickets, my work security pass, a small bottle of water and USB stick for work files. Items marked * were provided for consideration. eeeep love the hot pink bag. You're bag looks so nice & organised. You put mine to absolute shame. Im off to clean mine now. Aww thanks @thebeautydispensary :) I think pink looks good on everyone!